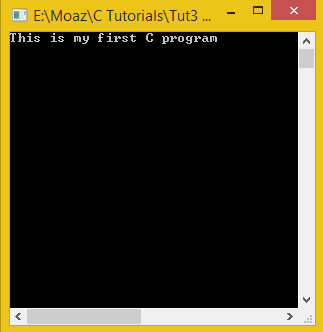 In this tutorial I will teach you how to write your first c program. NOTE: Whenever I write something after // or in between /* */ it means I am writing comments. Comments are not read by the compiler they are just a way to write your own notes after some statement. Just like some people write notes on the side of a book. In our first program we write our main function which is the heart of the program. Then we write an output statement known as the printf statement which simply outputs the text written in quotes on the screen (REMEMBER to write semi colon after every statement it tells the compiler that the statement is complete it’s just like a fullstop ) . After that we write getch function to pause the screen otherwise the screen will just blink and won’t be able to see the output. We keep writing the comments after every line for explanation (Remember they are not necessary). After writing this go to save select extension as .c source file and save. Go to execute -> compile. 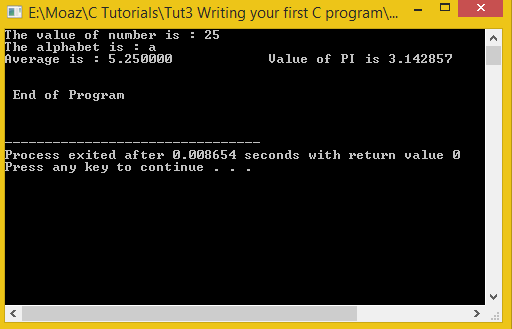 Here a console window will open and you can see the output. Declaring 4 different variables with 4 different data types. Remember a character is always written in single quotes except in print statement. First of all writing multiple line comments using /* */ and then writing the print statement for integer. ( Remember the integer is printed using %d a character with %c, float with %f and double with %lf ). Then we print the alphabet character variable, notice that we wrote \n in the next print statement that is for printing in a NEW LINE. Then we write the average and double variable with \t in between which means we want to give a tab space between them. In the end we simply write end of program after leaving three lines and close the main function bracket. Then save, compile and execute our program.